Now that the elections are over, world leaders have rushed to congratulate Prime Minister Najib on his electoral victory while glossing over irregularities that have rendered the elections suspect. It is quite clear to anyone who cares to look that the 13th general elections were the most fraudulent elections in our history. It failed, by any measure, to meet the minimum standards of free and fair elections. Of course, one would expect the likes of Iran’s Ahmadinejad to praise Najib for his leadership and for “the strong backing” he received. Undoubtedly, Iran now feels an extra special affinity for Malaysia given Iran’s own penchant for skewing the electoral process. What is surprising, however, was the reaction of other democratic governments. One would have expected that they would have, at least, expressed serious concern about the conduct of the elections instead of falling over themselves to congratulate Najib on his dubious victory. Translation: the Americans know there’s no chance at all that an impartial investigation will be conducted. And neither will one be demanded. As far as they are concerned, the lack of electoral integrity is just a minor and inconvenient fact that hopefully will be quickly forgotten. After all, there are arms to sell and the Trans-Pacific Partnership to seal. Catherine Ashton, the European Union High Representative for Foreign Affairs and Security Policy, took basically the same approach. She congratulated the Malaysian people for their peaceful and enthusiastic participation in the elections, as if that was any surprise. She then went on to congratulate Najib for having won another term. Noting concerns over “irregularities” in the electoral process, she naively expressed the hope that the competent authorities would investigate the complaints, never mind that the authorities are neither competent nor capable of an impartial investigation. It’s like expecting the cat to investigate who ate the canaries. British Prime Minister David Cameron and Australian Prime Minister Julia Gillard telephoned Najib to congratulate him on his victory. No indication that either of them took him to task over the electoral fraud. It’s business as usual. Najib, in any case, professed himself “satisfied with the process and the credibility of the elections.” Message to the rest of the world: don’t hold your breath waiting for an investigation. Given the critical importance of free and fair elections, other democratic governments have no right endorsing the outcome of elections in the absence of independent verification. If they themselves don’t have monitors on the ground, they should at least differ to independent local monitoring groups like BERSIH. Besides, there were so many warnings of electoral fraud before the elections but no expressions of concern from the international community. Clearly, western democracies are great at trumpeting lofty ideals but terrible at putting them into practice. Profits take precedent over principles. Better the dictator you know than the democrat you don’t. All talk about strengthening democracy are empty words and meaningless rhetoric. 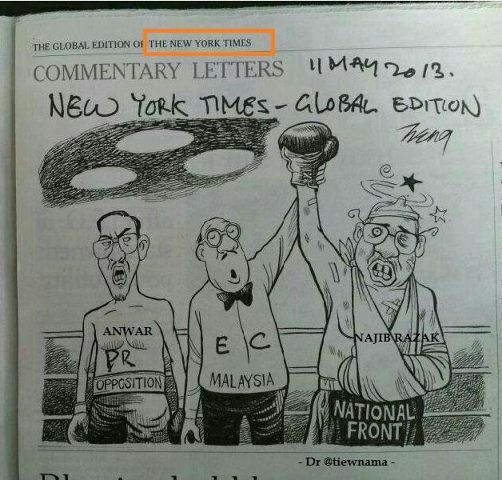 In the aftermath of GE13, Malaysians, in the their frustration, petitioned the White House. According to the Associated Press, the petition drew more than 220,000 signatures within a week, making it the second most popular issue on the site. While it helped draw international media attention to the issue, it is, of course, an exercise in futility. Malaysians must know that in the struggle for freedom and democracy, they are very largely on their own. They must look to themselves, to what they believe in and find the strength, courage and determination to press on until Malaysia is truly free. I wanted to ask permission to use a quote of Dennis Ignatius in a calligraphy project I am involved in. Please would you contact me to let me know how to go about this. Sure, no problem. Appreciate appropriate acknowledgement.